Obsessive self-promotion, an aggressive triggering response, and retaliatory rants. Even before Donald Trump entered America’s highest office, an international survey revealed that narcissism is part of the assumed “national character” of Americans. While only a small number actually meet the criteria for Narcissistic Personality Disorder, those exploitative few have a way of gaining center stage in our culture. 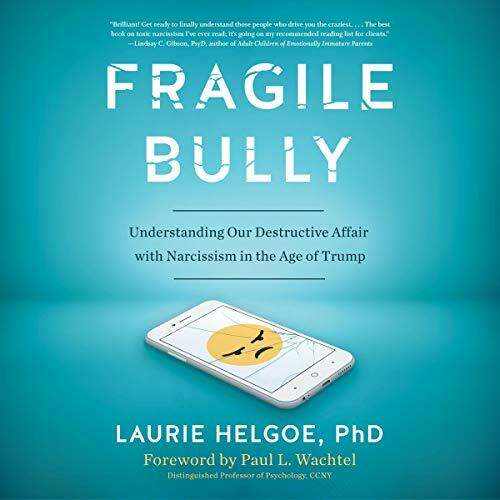 Fragile Bully: Understanding Our Destructive Affair With Narcissism in the Age of Trump looks beyond the sound bites of self-aggrandizing celebrities and selfish tweets to the real problem of narcissism. We see past the solo act to the vicious circles that arise in relationships with a fragile bully, and how patterns like this generate both power and self-destruction. We also look at the problem of Echo, how so many of us get hooked by the narcissist, and how variations on the destructive affair leave both partners dehumanized and diminished. Once we recognize the steps in each dance, we can break the cycle and allow and the possibility of true engagement. ©2019 Laurie Helgoe. (P)2019 Brilliance Publishing, Inc., all rights reserved. A captivating, informative, and unnervingly relatable book about Narcissism in America. Routinely while listening to this book I would relate personally to the descriptions of narcissism and the dangerous dances it traps people in. I was shocked by how much these concepts of the fragile bully have and still do affect me, my relationships, as well as our society as a whole. This an important book for anybody living in these divisive years. Fortunately this book is not only enlightening but it provides practical guidance on how to connect with narcissistic people, how to maintain a healthy amount of narcissim in your own life, and how as a society we can lower our defences and begin to connect with one another. Incredible book - Highly recommend! This book really helped me understand narcissism and how it affects the people in the my life. The writing is concise and clear. The examples about author’s narcissistic father really illuminated and grounded the book’s themes. The narrator was easy to listen to. Buy this book!